Last edited by Wolfman; 11-30-2018 at 07:50 PM. Last edited by Wassaby; 11-30-2018 at 10:54 PM. Based on the motor trend article the GTR BS will be a well anticipated model for sure!! and unfortunately, definitely not for me! How much did it go down? Questioned my dealer about this. He thinks it’s down to changes in testing regs in Europe since I was looking at launch figure for GTR. Saw the car in the flesh yesterday and I like the front end, it could use a real wing on the rear to balance out the aggressive front end. The carbon fiber front fender venting looks like a cheap add on when you look at a Porsche GT3 RS. Last edited by ronin amg; 12-01-2018 at 09:08 AM. I agree ronin and thought the same thing. Front fender venting looks like a cheap add on à la GT3 RS. Looks like they cut a hole in the fender and slapped it on. Def. could have made it look better. Yeah Porsche designed their fender while Mercedes went shopping at Pep Boys..
I’m not sure; hopefully WhiteBlack will mention it. Just seen some USA dealer docs. 150 cars only confirmed for USA. Front fender vents look weak, like the fake 3 vents in the new facelifted R8's front hood. In contrast, stripes look good on RWS R8 but don't look good on the GTR Pro. I agree about the stripes; I'd delete them for sure. Not sure about the front wing vents; might need to see them 'in the flesh' as it were. 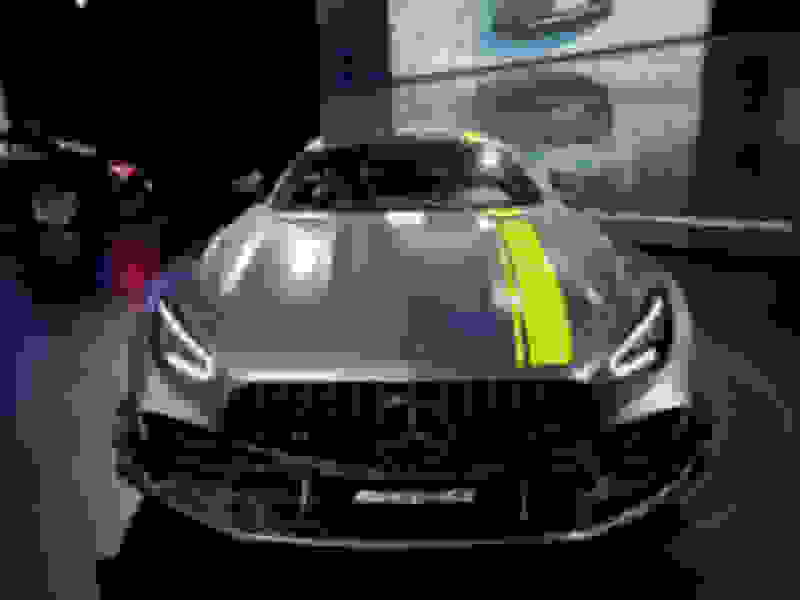 With great excitement, in addition the AMG GT facelift, we would like to announce the US debut of the limited edition 2020 Mercedes-AMG GT R PRO. “The agile responses to all driver commands and the overall performance now deliver even more of that incomparable feeling that our racing drivers experience on the track," says Tobias Moers, Chairman of the Management Board of Mercedes-AMG GmbH. The new limited-edition AMG GT R PRO is characterized by further improved driving dynamics, in particular on the racetrack. Experience gained from the AMG GT3 and AMG GT4 racing cars was influential in its development, and no other current production Mercedes-AMG is as close to motor racing as the new AMG GT R PRO. The improvements from motorsport can be clustered in four areas: suspension, lightweight construction, aerodynamics and appearance. Suspension: the optimal set-up The new AMG coil-over suspension offers even more choice for tailoring the set-up to the particular track. As in professional motorsport, the driver is not only able to set the spring preload length mechanically, but can now also adjust the compression and rebound of the dampers. This is done quickly and precisely without tools via a click system with an integrated adjustment dial on the damper. The compression rate is adjusted separately for highspeed and low-speed movements. This means that the settings can be dialed-in for slow and fast compression movements as is common practice in motorsport. 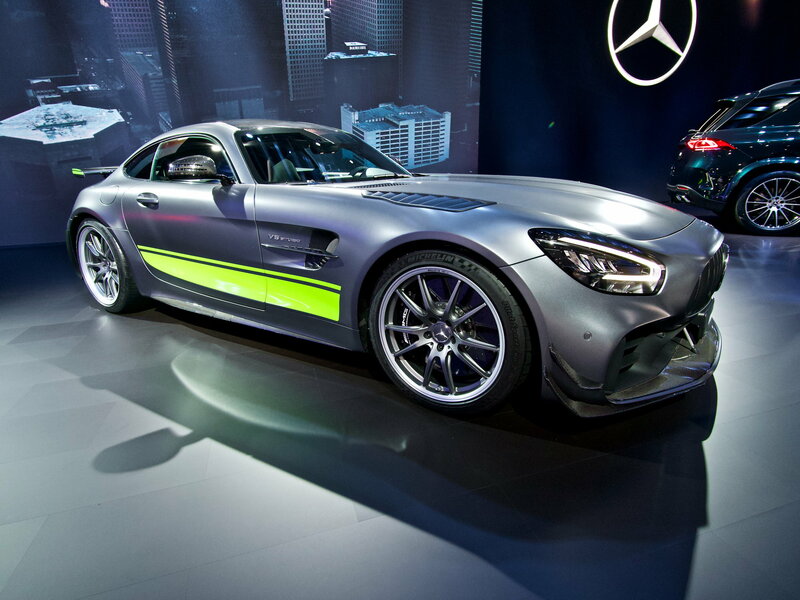 This allows influencing of the body dive and roll as well as the traction of the AMG GT R PRO even more selectively. The front axle is fitted with an adjustable torsion bar made of lightweight carbon fiber. Its’ counterpart at the rear is made of steel, and is likewise adjustable and also saves weight due to its hollow tube design. The AMG GT R is already fitted with Uniball spherical bearings at the lower wishbones of the rear axle. The AMG GT R PRO now gets these bearings also for the upper wishbones. They are significantly more wear-resistant than conventional wishbone bearings and due to their design have no play, which means toe-in and camber do not change even under high loads. As a result, the AMG GT R PRO can be driven with even more precision. A carbon-fiber shear panel in the underbody of the rear end also contributes to the high handling precision. This lightweight and rigid element stiffens the rear-end structure and adds additional stability to the body shell. The electronically controlled dynamic engine and transmission mounts were also retuned to further increase agility and deliver high-precision response and clear feedback. Lightweight construction: carbon-fiber components and new forged wheels In addition to a host of carbon-fiber components, weight is saved by making the ceramic composite highperformance braking system standard. And exclusively for the AMG GT R PRO, the brake calipers will be painted black with white lettering. 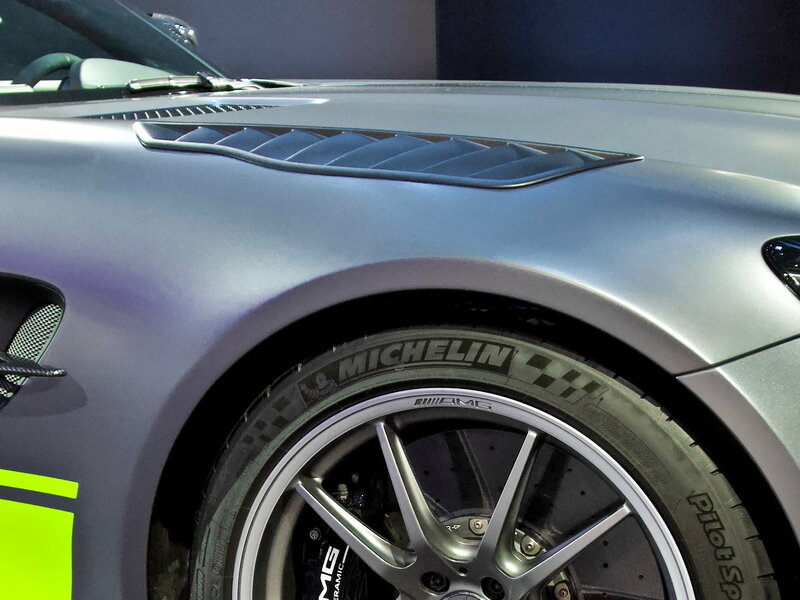 The lightweight AMG Performance Twin 5-spoke forged wheels are exclusively painted titanium gray and feature a rim flange with a high-sheen finish. Aerodynamics: redesigned front apron with additional flics Aerodynamic fine-tuning increases the overall performance of the AMG GT R PRO as well. The redesigned front apron was fitted with two flics at the sides made of clear-coated carbon fiber. The lower flics transition virtually seamlessly into the front splitter, which was extended further forward and is held by small metal braces that stabilize the front splitter at higher speeds. Additionally, they are another visual homage to the GT3 and GT4 role models from motorsport. The air slots, or gills, in the front fenders effectively vent the wheel arches and contribute to reducing front-axle lift. At the rear, a clear-coated carbon-fiber aero element at the wheel arch on either side rises up vertically almost to the level of the tail lights. The combination of all these measures significantly reduces front-axle lift without negatively impacting the aerodynamic conditions at the rear axle. 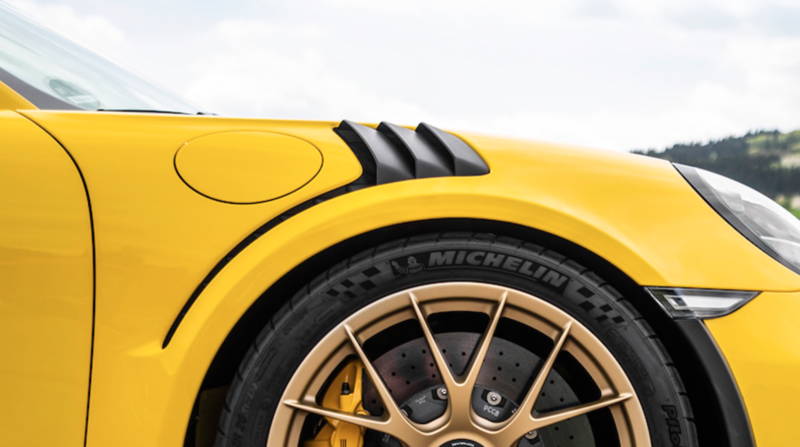 The active aerodynamics profile in the underbody, including the AIRPANEL active air regulation system in the front apron and the large spoiler on the hatch, all known from the AMG GT R, are part of the standard specification. In addition, the rear spoiler is fitted with a spoiler lip, which increases downforce at the rear axle, and now sits on milled aluminum brackets that underscore the motor racing influence. Motor racing looks: Carbon Package, new carbon-fiber roof, unique wrap The AMG GT R PRO doesn’t only drive like a racing car, it also looks the part. The standard Carbon Fiber Packages I and II with front splitter, fins in the fenders, trim strips in the side sills, side mirrors, rear spoiler, and a diffuser with high-quality clear-coated carbon-fiber finish emphasize the racing inspired design and performance. Additionally, the carbon-fiber roof has been redesigned with a lowered center exclusively for the AMG GT R PRO. The motorsport influence is also highlighted by the unique racing stripes running over the hood, roof and hatch as well as along the sides of the vehicle. These accents will be light green exclusively in combination with Selenite Gray Magno paint. For all other color variants, the stripes come in a Dark Gray Matte finish. (Optionally, the accents can also be omitted completely) Even before the world premiere, the new AMG GT R PRO has impressively demonstrated its performance potential on the racetrack: In early November, AMG brand ambassador and AMG GT3 racing driver Maro Engel completed a circuit of the Nürburgring North Loop in exactly 7.04.632 minutes driving a still disguised AMG GT R PRO. This considerably bettered the previous time for the AMG GT R and demonstrated the great potential of the current AMG flagship model. The front fender vents look like crap aftermarket add ons in person. Yep, that’s kind of what I’m thinking. Since the front fenders (wings) are carbon fibre why not just change the mold to have the vents integrated actually into the fender itself, like the GT3 RS does? My 2018 GTR is equipped and configured for the TRACK PACE APP Option 256 BUT Nobody knows when it will be enabled in the US. the power bump will be reserved for the BS and due to incorporating twin scroll turbos of the E to get a 630+ figure. I think beating a gt2rs is a pretty lofty goal. The BS could be a powerhouse like the SL was but not necessarily a track weapon or vice versa, but not both. I’m not sure this platform can handle 750+ hp on the track to be that much faster and compete with the gr2rs. Oh and a 4matic+ could mess up the balance due to added weight but bring Nissan GT-R magic to the table. To me the GTR is prettier than the pro and I am not sure when the BS will even surface for its testing let alone for sale so I’ll be sitting on my hands for now. I look to the last SLS, so I believe it will be both. Suspension dynamics and HP have come a long way in the last few years so tech is right there ready to go, and Renntech GTR I believe is 760 hp right now. Last edited by AMG 17GT; 02-22-2019 at 08:17 AM. Black Series cars have always been oriented towards a much stronger track focus so I don’t think the GTR BS will vary from that formula. It will I’d guess have at least 650hp and even more suspension tuning; weight reduction and enhanced ‘aero’ than the Pro. Ongoing MB Canadian lease rates for 2019 AMG GTR?